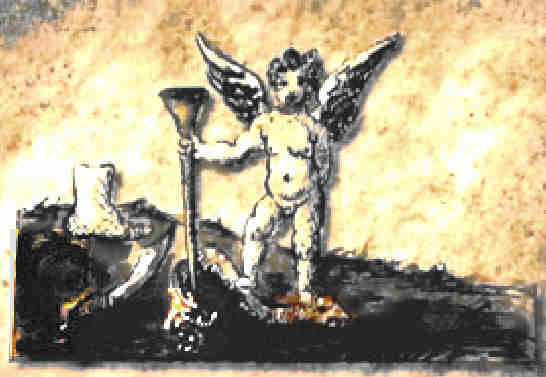 In this image : An Angel, death, Serpent, Snake. Ebola is a very deadly viruses that keep resurfacing as outbreaks in Africa. In 2014 there has been worsening Ebola outbreaks in Africa, and as of October 2014 the Ebola Virus is spreading worldwide, it started with an Ebola case in the U.S. in Dallas Texas. In 2014 there is a concern that the Ebola virus could mutate to go airborne and become a worldwide Doomsday pandemic. See my King James version Bible Code matrix on Ebola which has the word “airborne” in it. Will the Fourth Horseman Death ride as Ebola in 2015? Also: Can the Bible Code help us find the animal vector hiding place, the carrier host animal where the Ebola virus hides between outbreaks? This we will try to do. We will run the King James Bible Code to search for answers on the Ebola virus: where does it hide? There must be an animal host it hides in between outbreaks. The animal where it hides is a bat ! The Ebola outbreak that started in March 2014 in West Africa continues to spread, more than 4.000 (official) deaths so far. Is Ebola the Fourth Horseman of the Apocalypse in the Book of Revelation, Death, riding in 2015? Will Ebola spread worldwide in 2015? Will Ebola virus have a mutation, mutate to become airborne, resulting in a world epidemic or pandemic Doomsday end of the world Apocalypse plague? Note that the spreading of the Ebola epidemic is related to the rise of the antichrist (Putin? ), since the Ebola virus can twist into a 6 shape and 666 is the number of the antichrist. 18960 = 316×60=79x4x60=158×120. Corresponding to 158: Revelation 15:8, King James version, “the seven plagues of the seven angels”. Note that Ebola has 7 structural proteins. Therefore, I would watch out for an Ebola strain having exactly 18960 nucleotides. Also: corresponding to 18960, Revelation 18:8-9, “plagues come in one day”. Also consider that Ebola related to 76 (First discovered in 1976), and Revelation 17:6 “I saw the woman drunken with the blood of saints”. Also, the Book of Daniel, which is also about the Antichrist: Daniel 7:6, a beast like a leopard – Antichrist. Daniel 7:9, returned Christ. Daniel 8:9, corresponding to 18960, “a little horn” – the Antichrist Putin. *** Note that during Winter months Ebola will start spreading faster – From doubling every 4 weeks to every 2 weeks !!! Contains the words: AIRBORNE (ELS=2055), EBOLA, DEATH, MILLIONS, and therefore indicates Ebola may one day mutate to be airborne and spread to millions of people. 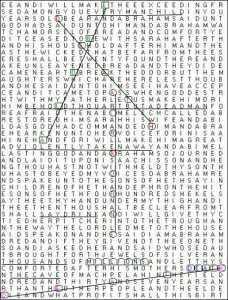 Other relevant words in this matrix: THOUSANDS, BEHOLD THOU ART BUT A DEAD MAN, VIOLENTLY TAKEN AWAY. SAY DRINK, Ebola results in fever and thirst. Also in other Old Testament matrix like Leviticus 5:3 – Leviticus 16:21 contain the words Ebola! Kenneth Mackenzie, also known as Coinneach Odhar or the Brahan Seer, was a legendary Scottish clairvoyant. Tradition dates his birth to the early 17th century in Uig, on the island of Lewis. This is the northernmost island of the Outer Hebrides, a chain of islands to the west of Scotland’s northern coast. Legend has it that he came into his talent after napping on a fairy hill and finding a small stone in his coat, which allowed him to view the future. Predictably, legend has it that he was eventually burned to death as a sorcerer by being immersed in a barrel of burning tar. Before his death he forespoke the doom of the noble Mackenzie family who had him executed: the last male heir of this line would be deaf. In the 19th century this came true, as the last of the Mackenzies lost his hearing in his youth. He is inevitably compared with Nostradamus. However, unlike Nostradamus, many of predictions attributed to the Brahan Seer are very straightforward and literal, instead of being cloaked in word games, riddles and allegory. For instance, a typical prediction is that a specific church roof would collapse when a magpie made a nest in it for three years running. There are predictions of the birth of a two-headed calf, a boulder falling over, and the plaintive death of a French expatriate in the Isles, mourned by a local woman. Other reputed predictions were of “a chariot without horse or bridle”, and “fiery chariot[s]” which could interpreted as a premonition of railroads or automobiles (p. 35), and “hills strewn with ribbons”, (p. 10) which sound like powerlines, but this is about as futuristic as he gets. Unlike Nostradamus, none of his predictions are about geopolitics, global war, or the distant future. The problem with the Brahan Seer is that there is no contemporary or historical record of any such individual ever existing. This is not surprising given the paucity of Scottish written sources from that period. This book, written by the noted Scottish folklorist Alexander Mackenzie, is the primary source for the Brahan Seer legend, and it was written in the late 19th century. The fact is, there are no Brahan Seer manuscripts or old editions with known provenance which could be used to back-test his predictions, as with Nostradamus. These accounts are oral tales which doubtless ‘grew in the telling. Given the Scottish fascination with ‘second sight’ and story-telling, it is not impossible that the Seer’s best predictions were invented after the fact to match up with events, and a generation or two later ended up as being accepted as fact. Indeed, it appears that people are still creating Brahan Seer lore.